The Iveco Daily is not like other large vans. For instead of an all-in-one structure, it uses a separate chassis with a body bolted on top, just as it has done since it was first introduced in 1978. This means that even this third-generation Daily, on sale since 2014 and thoroughly updated in 2019, is more closely related to trucks than to any rival van model. This inclination comes from Iveco’s background as a truck manufacturer. The advantages to this design are strength and toughness – the Daily is available with gross vehicle weight (GVW) ratings up to 7.2 tonnes, far in excess of any other large van. In fact, in this guise, its closest competitors are light trucks. Yet since the Daily still has the driving position and sizing of a van, it is potentially much more city-centre friendly. At the same time, the Daily’s structure allows for some absolutely enormous body variants – particularly in terms of length. So if you need maximum space and some particularly high payload options, it’s well worth considering. The separate chassis makes it very capable in heavy-duty towing use, too. To take advantage of the higher GVWs, however, you’ll need to have a suitable driving licence; those with regular car driving licences are restricted to a 3.5-tonne GVW maximum – at which point the Daily’s very strength becomes a weakness. Which is to say the tough build is so comparatively heavy that the available payload on a 3.5t GVW Daily is likely to be less than on any equivalent rival. This despite the current version being considerably lighter in build than previous generations. In the most significant overhaul since its launch in 2014, the 2019 Iveco Daily benefits from a new-look front end - including a new three-piece front bumper (for cheaper replacement costs) with built-in step - a revised interior, and a number of mechanical upgrades. Making this so-called 'New Daily' a substantial improvement over the preceeding models. We've driven it, and it forms the major part of this review. The 2.3-litre engines now feature an electronically controlled variable geometry turbocharger (e-VGT) for faster response and better efficiency, although no actual increase in power or torque. The two more powerful versions are now available in Heavy Duty spec as well as the standard Light Duty variants. The top-spec 3.0-litre engine boasts an e-VGT, too, and this pushes power on that motor up to 210hp - making the Daily the most powerful van in its class. The other two 3.0-litre options stick with the standard pneumatically variable turbine. All the 3.0-litre engines are rated Heavy Duty. Partly as a result of all this, the Daily is the first van in its class to meet the new Euro 6D Temp emissions regulations. The 2019-onwards New Daily also benefits from electrically-assisted power steering (EPAS), which brings it into line with the likes of the latest Volkswagen Crafter, Mercedes-Benz Sprinter and Ford Transit. EPAS not only reduces the amount of effort needed to steer the Daily - especially at lower speeds, where a special City button increases assistance even further - but also enables a number of new active safety aids, including proactive lane keeping assist. The New Daily is also available with adaptive cruise control, autonomous emergency braking and crosswind assist now, while Hi-Matic automatic versions can be fitted with something called Queue Assist, which automatically follows the vehicle in front during stop-start traffic. Hill descent control and a Traction Plus grip-finding driving mode are available, too. Other updates for 2019 include the option of LED headlights, and a revised interior which finally offers a two-way adjustable steering wheel, improved instrument cluster and new-generation infotainment system with Apple CarPlay and Android Auto. A new on-board connectivity box, MyDaily web portal and app, and Iveco fleet management software brings connectivity right up to the cutting edge as well - even offering remote diagnostics and, in some cases, repairs. Prior to this 2019 upgrade, the previous round of Daily upgrades came in 2016, when the Daily Euro 6 or Daily E6 was introduced to meet the initial round of Euro 6 emissions regulations. In late 2017 there was a further update introducing the Daily Blue Power range – an efficiency-focused family of models easily identified by their controversial blue detailing (it’s the wheels that really make people raise their eyebrows…) and racy red seat belts. Claimed to be the first vans to meet so-called Real Driving Emissions regulations (which don’t come into force until 2020), these are also known as the Daily RDE models. 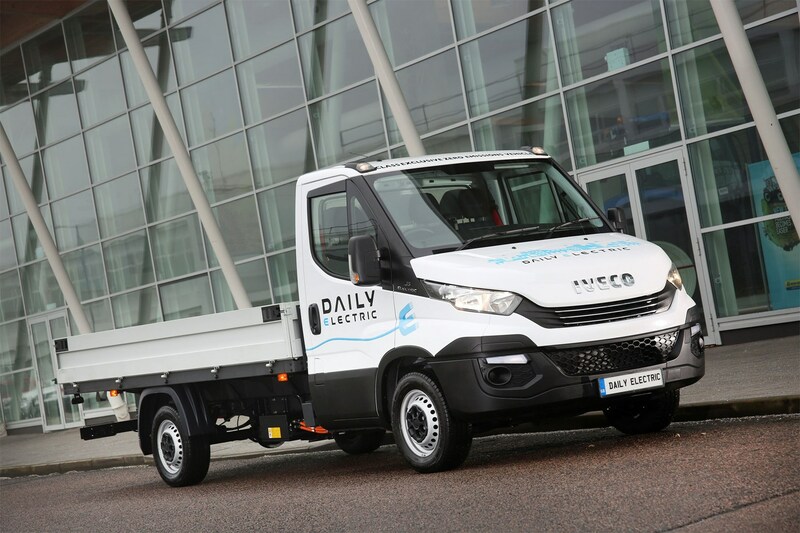 As well as conventional panel vans, the Daily is available with various chassis cab conversions - including tippers and box vans - and in minibus variants. This review deals mostly with the panel van. Regular Daily models have either 2.3-litre or 3.0-litre four-cylinder diesel engines, with power output ranging from 116hp through to 205hp (210hp from 2019). However, Iveco also offers alternative fuel vehicles in the form of the 136hp Daily Natural Power, which runs on Compressed Natural Gas, and the Daily Electric, available with a choice of battery configurations depending on whether your priorities are maximum driving range or maximum payload. All conventional models are rear-wheel drive, though four-wheel drive conversions are available. 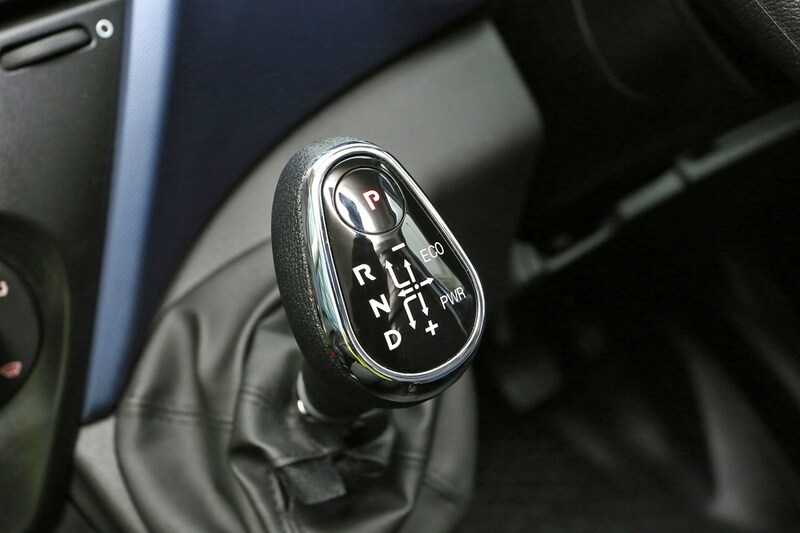 The Hi-Matic eight-speed automatic gearbox is an optional extra that’s well worth considering. Keep reading for our full review of the Iveco Daily, but suffice to say this is an impressive vehicle – especially if your priorities stretch beyond 3.5-tonne gross vehicle weight. Pick the automatic, and the driving experience is easy-going, too, with light steering and engines that provide plenty of power. Payload at 3.5-tonnes is a weaker area, however, and even following the 2019 facelift the cab interior is outclassed by the best rivals for both quality and functionality. As such, there are other large vans that may better-suit individual operators. But for heavy duty activities and towing, the Daily is definitely worth a closer look. The Iveco Daily’s engines are provided by Fiat Powertrain Technologies (FPT), which specialises in commercial and industrial power units. They come in either 2.3-litre or 3.0-litre four-cylinder turbodiesel configurations with the following output combinations. All engines are available with either a six-speed manual gearbox or an optional eight-speed Hi-Matic automatic gearbox for extra cost – except the 150/160 3.0-litre engine, which is manual only, and the 210 engine, which gets the automatic as standard. All of the 3.0-litre engines are rated Heavy Duty (which means Iveco is not obliged to provide fuel economy data), while the two more powerful 2.3-litre engines are available in Light Duty and Heavy Duty variants; the entry-level 2.3-litre 120 is Light Duty only. Drive is sent to the rear wheels. Even before the introduction of the electronically variable-geometry turbos (2019 onwards on all 2.3-litre Dailys and the 210hp 3.0-litre), we've always considered these to be lovely engines, with plenty of power from the entry-level upwards and reasonable refinement, too. The move to e-VGT technology - a first in a van, we believe - only enhances the impression of effortless performance. The electronic control acts with far greater speed and precision than the previous pnuematically controlled variable-geometry turbos could manage, meaning you get quicker engine response and the promise of improved fuel economy. Sampling a 156hp 2.3-litre model, we found this still took a short moment to get going initially (unless you're brutal with the accelerator pedal), but once up and running you can really tell there's more engine capacity here than you get from the increasingly common 2.0-litre rivals. The Daily just feels more instantly muscular. It's not absolutely silent at speed - there's a particularly curious, though not unpleasant, roaring noise that comes in towards the top of the rev range - but we weren't at all bothered by vibrations in the cab, and found the loudest element of the whole experience was wind noise at motorway speeds. There's really very little engine or road sound inside. That said, the last 156hp Blue Power model we drove without the e-VGT system in 2018 effortlessly shrugged-off a test weight in excess of 1,000kg, so if you can't afford the latest Daily engine range you'll still be getting a potent van. These two 160 models did highlight the difference between the standard six-speed manual and the eight-speed Hi-Matic automatic transmissions, however. Given the choice, the auto is by far the better option - the manual proving to have a lengthy and vague shift action that occasionally found us accidentally selecting too high a gear. It is mounted pleasingly close to the steering wheel, however. The upgrade cost to Hi-Matic is minimal, and it makes the Daily easier, quieter and more efficient to drive in the real world. It will also prevent clumsy drivers from prematurely destroying clutches, thus lowering your operating costs. We’ve also previously driven the longest possible Iveco Daily body variant – which is truly huge at over seven metres long – with the 180hp 3.0-litre engine. An engine this size is something of an indulgence these days, but its smooth performance almost justifies the expense. This is a particularly heavy-duty van, and this is reflected in the unladen ride quality – which is bumpy, to say the least. Put a bit of weight in the back, however, and you’ll find this substantially improved. In fact, the 2019-onwards version we've driven complete with test weight felt very composed over some particularly bumpy Italian road surfaces, with only the very worst ruts and lumps transmitting shocks through to the passengers in the cab. You can make life even better for the driver in this regard by specifying a suspensed seat to further soak up any surface disturbances. So, despite the truck-like chassis, the Daily feels more than capable of delivering decent long-distance comfort, even though ultra-modern vans like the VW Crafter and Mercedes Sprinter still have the edge in this regard. The Daily's steering has always been light, making it surprisingly easy to manoeuvre for such a big vehicle. The new electrically assisted power steering takes this is a stage further by adding a City button to the dashboard. Press this, and it boosts assistance to the point that steering effort is reduced 70%, making it even easier to palm this big van around in tight spaces. The flipside to this convenience is a slightly dead area around the straight-ahead position, which creates an odd sensation akin to a piston moving suddenly through oil as you push beyond this point to turn the van into a corner. It's not awful, but it doesn't quite have the consistency in response of the previous steering system. Still, we found the 2019-on Daily straightforward enough to keep pointing in the right direction on the motorway - helped by the smooth and gentle intervention of the new lane keeping assistance system - and well-controlled when tackling high-speed slip roads. It's not quite as car-like as a Sprinter or Crafter, but for a vehicle with a separate chassis it does very well indeed. In 2017, Iveco introduced a new Blue Power range to emphasise the Daily’s environmental credentials. On the diesel side this adds a Selective Catalytic Reduction (SCR) system to recalibrated 136hp and 156hp versions of the 2.3-litre motor, cleaning up their emissions beyond what’s necessary for basic Euro 6 regulations compliance and creating what’s officially called the Daily Euro 6 RDE 2020 Ready. Further enhanced with standard-fit stop-start technology and eco tyres these claim to reduce fuel consumption by up to 7% in real-world driving. The Daily Blue Power range also encompasses the Daily Natural Power and the Daily Electric, which we’ll deal with in more detail below. 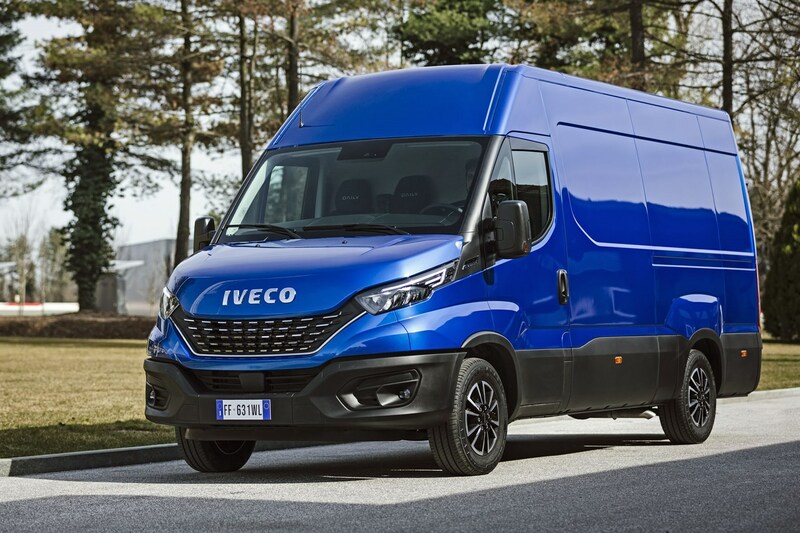 Iveco also sells the Daily with a 3.0-litre CNG engine powered by Compressed Natural Gas, called the Daily Natural Power and now part of the Daily Blue Power range. This produces 136hp and 350Nm of torque, so again is hardly lacking in get-up-and-go. Compared to the diesel alternative it’s also quieter and more refined – and still capable of hauling a 7.2-tonne Daily loaded with over 3.0-tonnes in the back. Again, this is best with the Hi-Matic transmission. The final option in the Daily Blue Power range is the Electric model – which as the name suggests is powered by a zero-emission (in motion) electric drive system. Available with a up to three battery packs, and claimed capable of driving 124 miles between charges, this sounds good on paper – making it seem like a worthy rival to the Renault Master ZE, VW e-Crafter and Mercedes eSprinter. 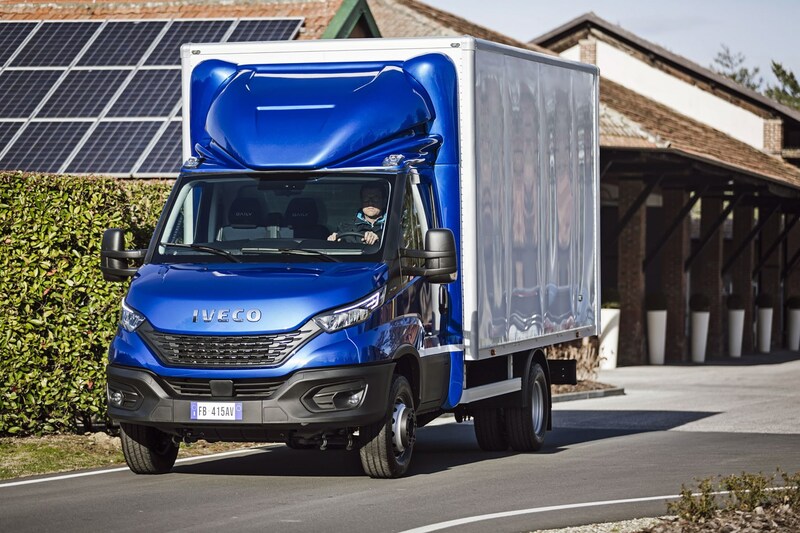 However, our experience with an earlier version proves Iveco’s electric technology to be painfully slow, while the additional weight of the batteries eats into payload. It’s also very expensive. So it’s not our favourite Daily variant. But it can be fully recharged in just two hours, which is impressive – subject to the correct charging facilities, of course. The cab design of the Iveco Daily hasn't massively altered with the introduction of the facelifted 2019 model, but there have been some worthy and interesting modifications. 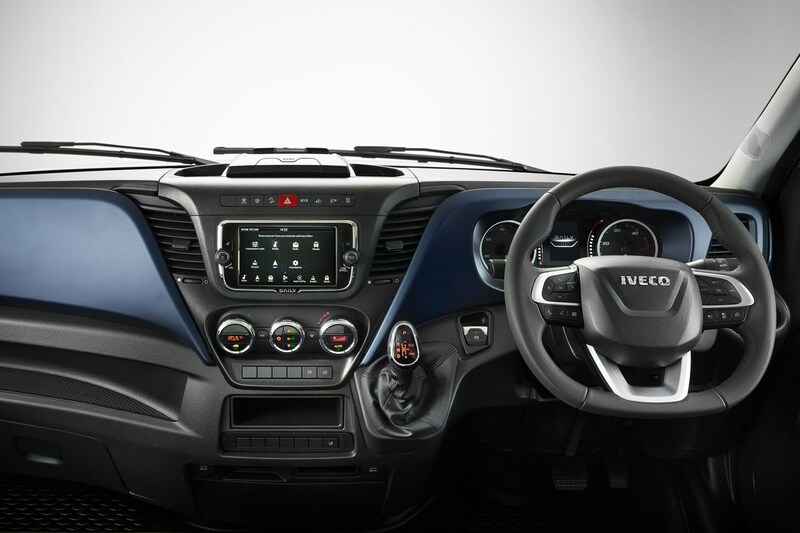 So while the basic shape of the dashboard hasn't changed - and neither, sadly, has the standard of fit and finish, which is average at best - Iveco has swapped in a smaller steering wheel, added a central TFT display to the instrument cluster, and added a new Hi-Connect infotainment system option. Squared-off at the bottom to increase legroom, flattened at the sides to increase grip area, some people will likely think this very odd indeed. But we found it easy to get to grips with (pun intended), while the smaller diameter made the steering itself seem more responsive. Better yet, the new steering wheel is now double adjustable - meaning you can move it up and down and forward and back. Welcome to the 21st century. Ditto, you'll find there are a load of button controls on the wheel itself now, many of which operate the new TFT display nestled between the main dials in the instrument cluster. This is not especially innovative, as plenty of other rivals have used similar equipment for years, but this enhanced trip computer is commendably well designed, and gives you access to a lot of information in an easy to digest format. As well as typical trip functions such as fuel economy and driving range information, it also allows you to view and tailor various safety parameters (depending on what equipment is fitted). The new Hi-Connect infotainment option includes Apple CarPlay and Android Auto, and becomes the new top-spec choice above the existing basic radio and touchscreen media systems already available in the Daily. 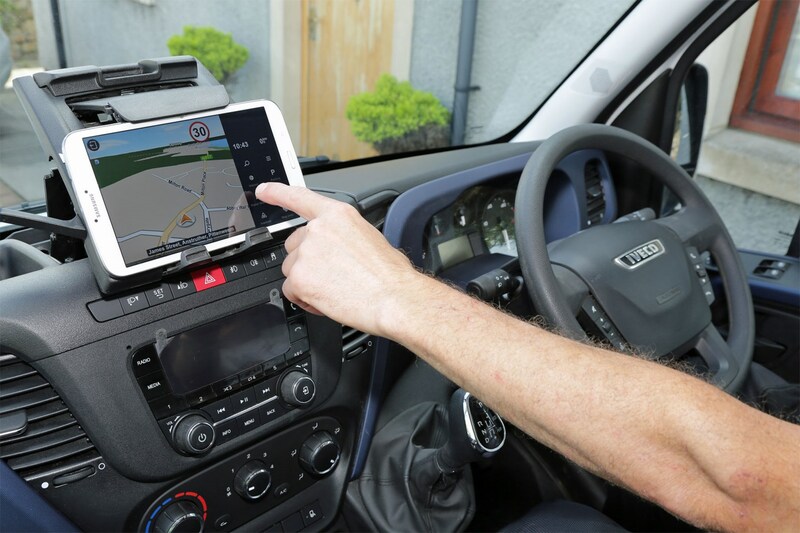 It can be enhanced with TomTom's truck-spec sat-nav if you want it - the truck part meaning you can specify the vehicle's dimensions to avoid ending up stuck at a width restrictor - but the smartphone integration means you can easily use Google Maps or Waze, regardless. 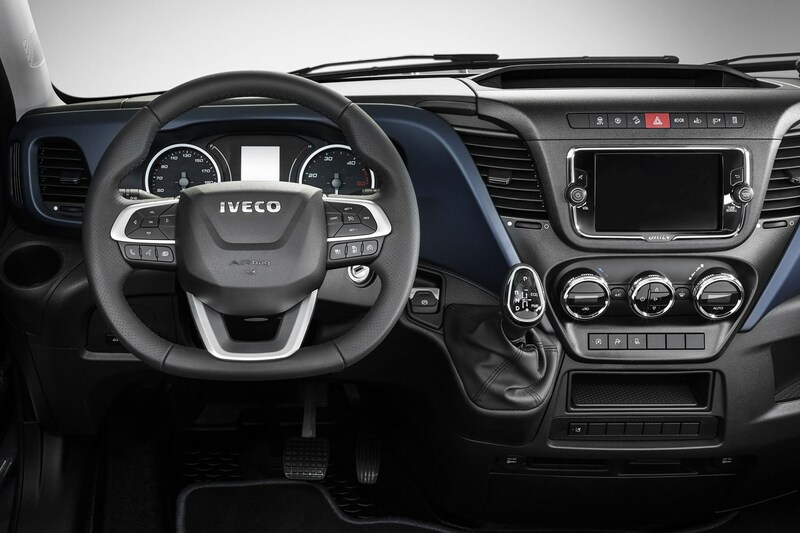 The new 'connectivity box' option, meanwhile, is Iveco's own take on a state-of-the-art telematics system, available with a range of services to suit the smallest operators to the largest fleets. Iveco's even built itself a dedicated call centre to support this, as well as the MyDaily web portal and app, which can issue monthly smart reports to give you an overview of how your fleet is performing even if you don't have a fleet manager. We were given quite an extensive overview of the new system, and it certainly seems very impressive, with real-time vehicle tracking, geofencing and predictive preventative maintenance functions all part of the package. The connectivity box is able to interface with existing fleet management software, should you already have a system you'd prefer to stick with. The Iveco Business Up app (see below) also continues, for those not interested in going down the full connectivity box route. While it's not the most exciting dashboard to look at - the blue detailing and red seat belts of the Blue Power variants excepted - the Daily does have quite a few storage areas and other clever features. You'll find twin lidded bins over the instrument cluster and the passenger side of the top of the dashboard, while the section in the middle can be customised from a slot that's handy for paperwork to a pop-up clipboard. The glovebox isn't especially large, but there is a useful shelf above this, and three tiers of storage areas in the doors. As well as underseat storage, you can spec the middle seat back with a fold out desk space that cleverly cantilevers outwards to retain storage space beneath it. The seats themselves have surprisingly sculpted backs and are reasonalbly comfortable, with a good range of adjustment for the driver - though the base on the passenger side is a little firm and unyeilding. Generally speaking, the buttons for the secondary controls, including the heating and ventilation system, are clear and easy to use; the basic radio is rather fiddly, however. Forward visibility is good - though some may complain the dashboard is a little high, this didn't bother us - while large side mirrors help you keep track of what’s going on around you. 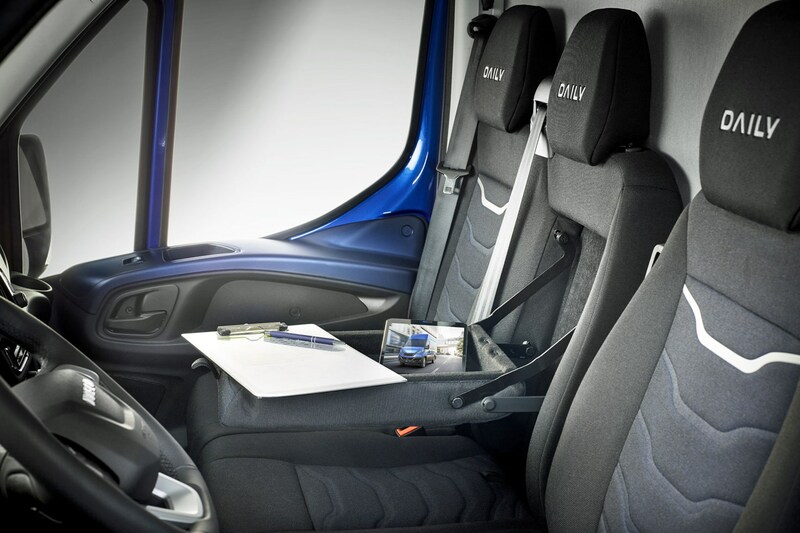 From 2019, the Daily is available with an electric parking brake, which not only saves space in the cab (you can now fit a reasonaly large bag in the space between the driver and passenger seats) but also operates automatically. 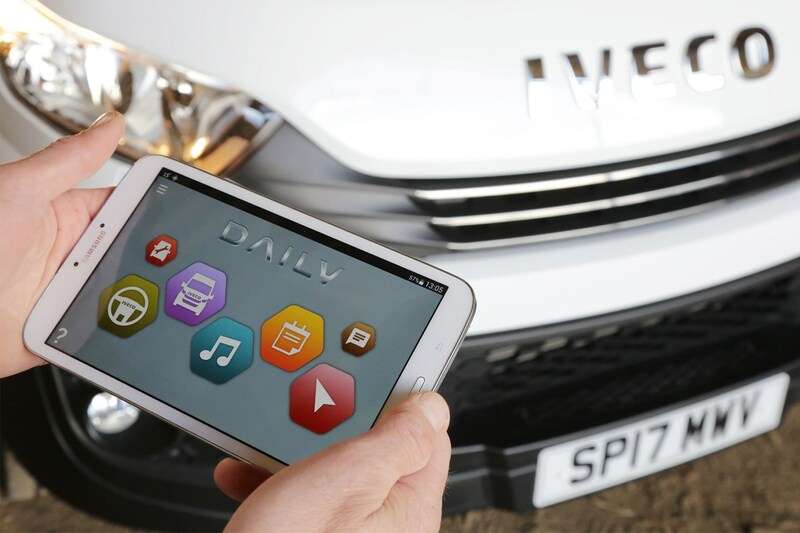 Iveco isn't shy of innovation, as the Business Up app demonstrates. This allows you to sync your Daily with a smartphone or tablet application, which can then give you real-time driving advice aimed at improving fuel economy or finding the best driving route. It’s all swings and roundabouts when it comes to Iveco Daily running costs, as the advantages of long service intervals, a five-year warranty and truck-based servicing provision attempt to balance out the lack of published fuel economy data and hefty basic weight of this vehicle. Overall, Iveco claims the 2019 Daily will be 10% cheaper to run in urban driving than the previous version, helped by features such as the new three-piece front bumper; apparently only a single section will need to be replaced in 90% of bumper damage incidents. The Daily is always going to struggle to delivery fuel economy (mpg) that will challenge the top of the class due to its heavy-weight, truck-style construction. Even so, it’s a shame that Iveco makes casual running cost calculations more difficult by refusing to publish fuel economy figures; many versions of the Daily are listed as Heavy Duty, which means they don’t have to meet quite the same requirements as Light Duty vans, but it’s not as if fuel economy hasn’t been measured as part of the homologation process, so the figures do exist. 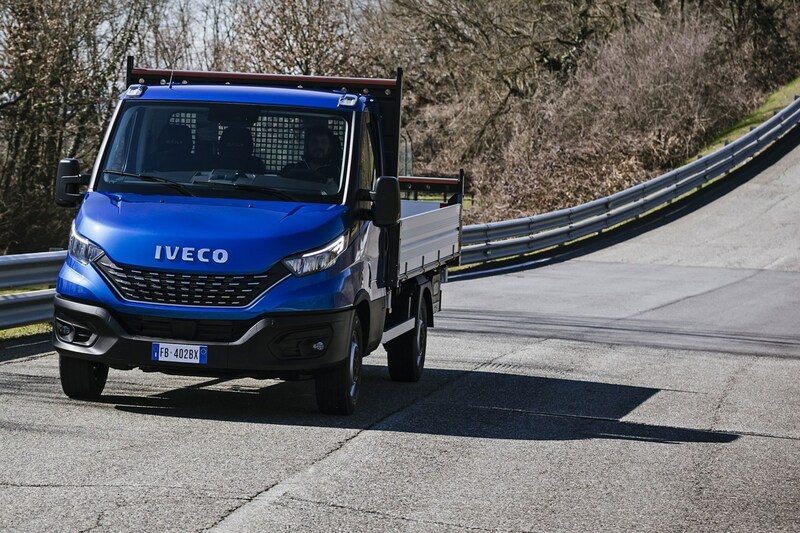 And although we take Iveco’s point that the testing procedure doesn’t accurately represent real-world driving, the test figures remain a solid point of comparison between rival vans, something that Iveco has deliberately chosen to make more difficult. We find this very disappointing. 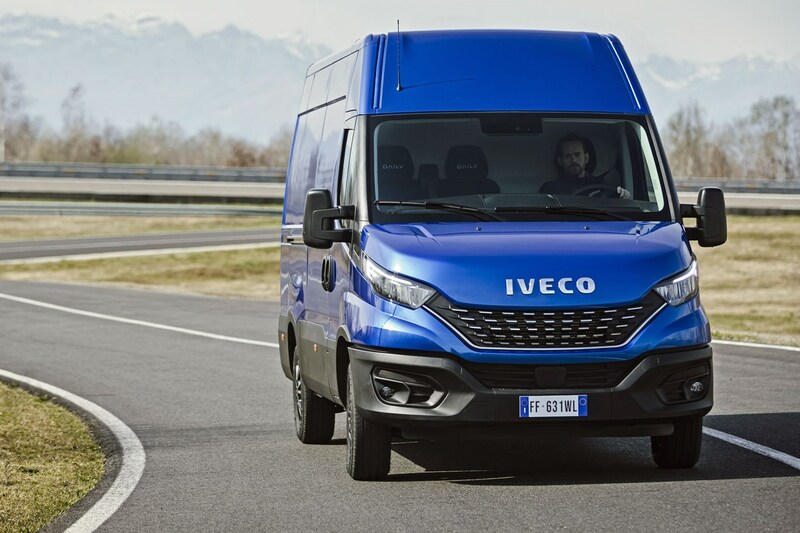 What’s more, it makes something of a mockery of Iveco’s claims that the 2019-onwards Daily models, with their Euro 6D Temp compliant engines, are up to 10% more efficient than the previous version in urban driving. Since we don’t have the previous figures, either, this is basically meaningless. Ditto claims that the Blue Power range introduced in 2017 was 7% more efficient regular Daily Euro 6 models of the same vintage. Still, tangible evidence that Iveco is trying to improve the Daily’s real-world fuel economy comes from the adoption of ever more efficient low-rolling resistance tyres, those e-VGT engines – with all 2.3-litre versions fitted with stop-start as standard as part of the 2019 revisions – and the electric power steering, which saves weight as well as fuel. There’s also an Eco button in the cab, which optimises the engine to maximise efficiency at the cost of some performance. The Daily comes with a five-year, 100,000-mile warranty as standard, which is among the best in the van sector. 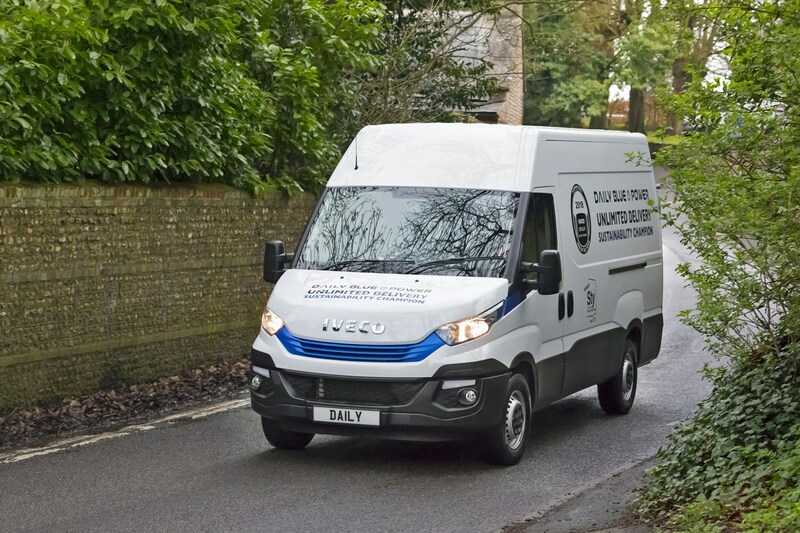 Upgrades to the engines for 2019 also see service intervals extended up to 60,000km – the equivalent of just over 37,000 miles – which no other van maker can currently match. 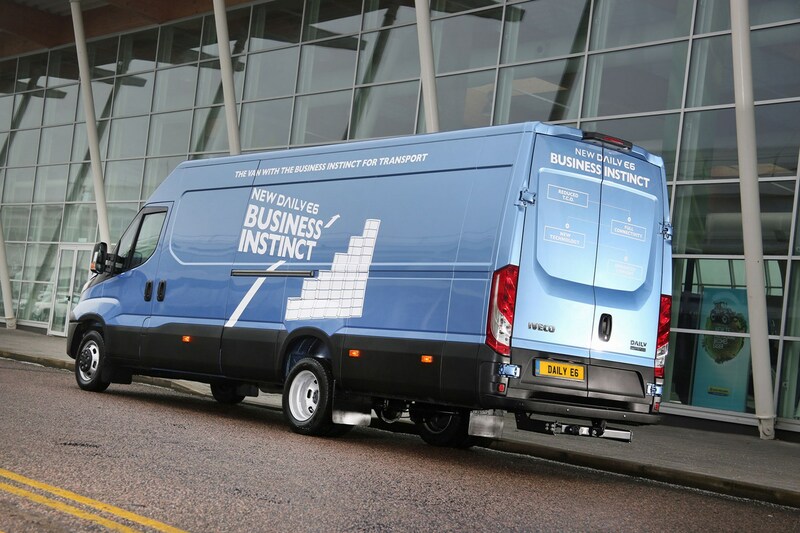 The closest is Ford, which has 36,000-mile servicing intervals on Transits fitted with the 2.0-litre EcoBlue engines. 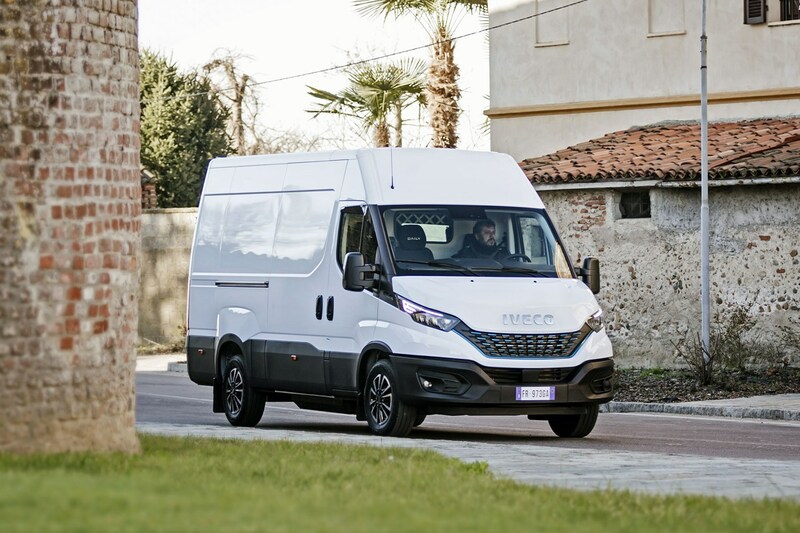 Another innovation that comes as part of the 2019 update is the option to add a connectivity box to the Daily which puts it into constant contact with Iveco’s customer service centre. 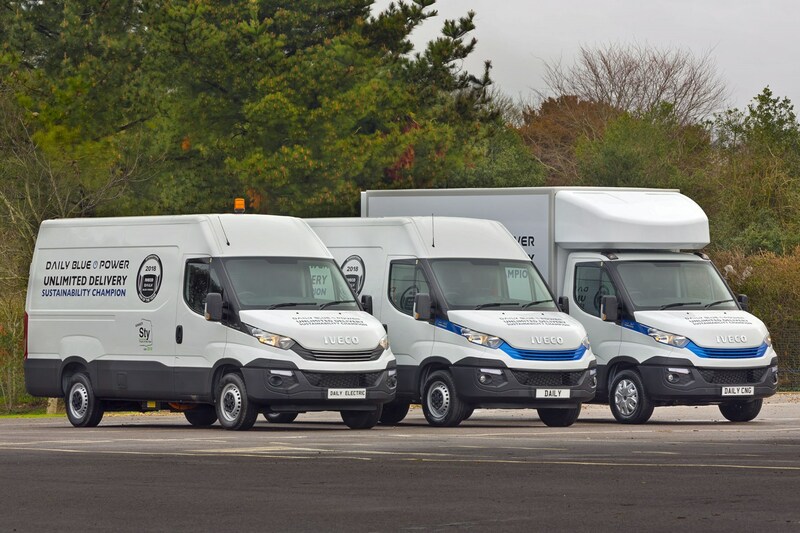 As well as enabling various fleet management functions, including the option to book regular servicing, this also allows Iveco to monitor the van for signs of impending maintenance issues. As data is collected, the system learns the early warning symptoms of potentially major problems – it can then give owners and operators enough notice to book the van in for pre-emptive repair at a time that minimises their downtime. Very clever. Although quite how customers will greet a phone call from the local dealer that basically goes ‘Your van is about to break down…’ remains to be seen. Get over that psychological hump, however, and this is surely a very useful feature. The same box of tricks also enables remote fault diagnosis, and in some cases even repairs. See the Reliability section below. Even without the fancy new connectivity systems, the Daily benefits from a dealer and servicing network that’s geared up to support trucks. This means extended opening hours, so it should be easier to find a time to get your van serviced that doesn’t inconvenience your business. There’s also Iveco’s Assistance Non Stop (ANS) breakdown service, which operates 24 hours a day, every day of the year. 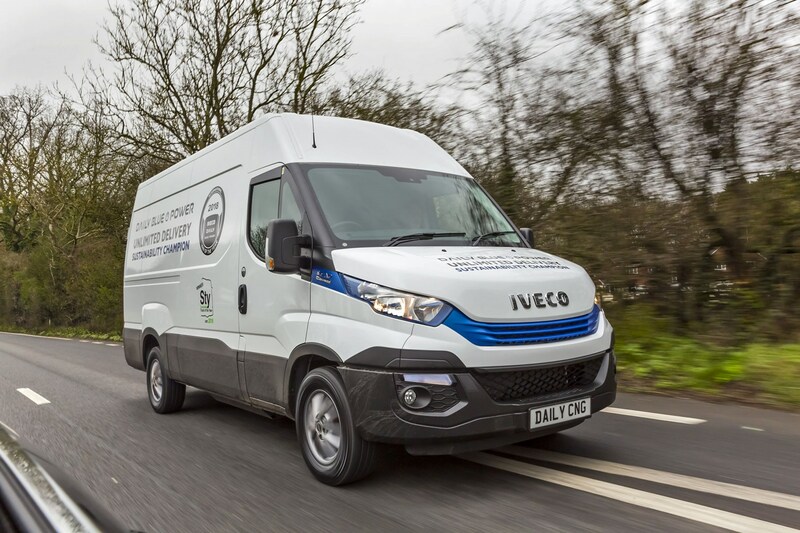 You’ll find that Iveco offers various servicing and maintenance packages to help spread costs, but the actually dealer network is on the small side. As of 2019, there are 18 main dealers in the UK, plus 35 satellite repairers and a further 34 authorised repairers. The Daily is sold in a single basic specification – so there are no trim levels as you might find with other vans – which can be tailored to your exact needs via an extensive options list. 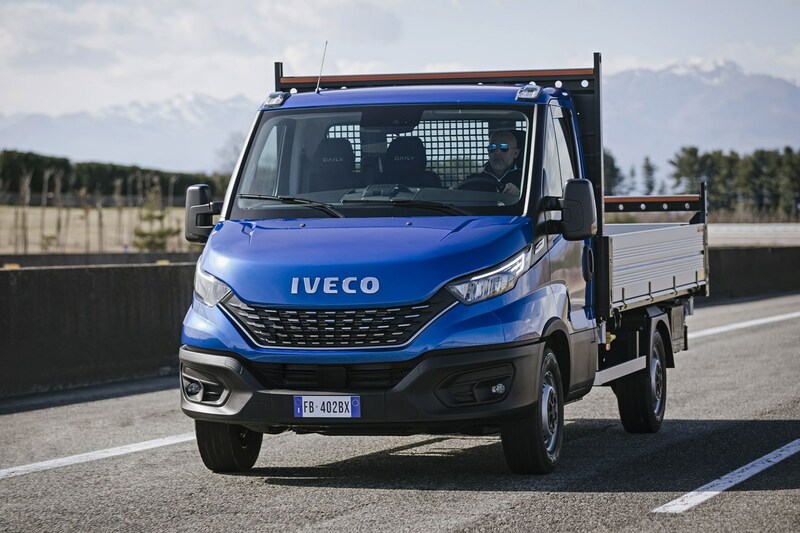 To make some of the latest safety and technology options more attractive, Iveco is bundling a number of them together into options packages that offer reduced pricing versus adding the items individually. It’s still a shame not to see all of the safety equipment fitted as standard, but costs continue to rule in many areas of the van market. 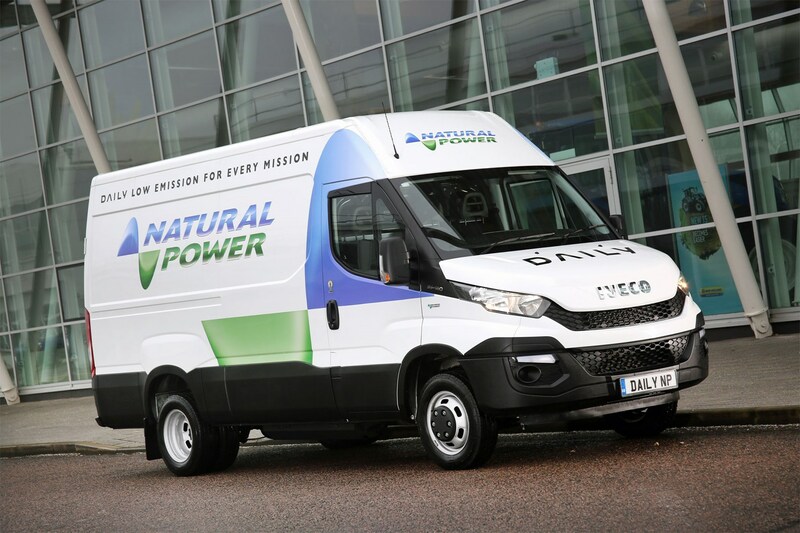 Both the CNG-fuelled Iveco Daily Natural Power and the Iveco Daily Electric will offer running-cost advantages alongside dramatically reduced emissions. However, these advantages have to be balanced against the purchase cost, which is generally higher - and especially in the case of the Daily Electric - and the complexities involved in keeping them fuelled. You can find out more about CNG (compressed natural gas) in our VW Caddy TGI review. The Daily has a reasonable reputation for reliability historically, with the previous version only really bothered by less serious common faults - ball joints, binding callipers and injectors being the main worries. As previously mentioned, Ivecos benefit from truck-level aftersales, which means thorough servicing and the dealers are usually well stocked on parts, which tend to be reasonably priced. The 2.3-litre engine from Fiat Powertrain Technologies has been in use for years in the Fiat Ducato, and is also fairly well respected for reliability and efficiency. 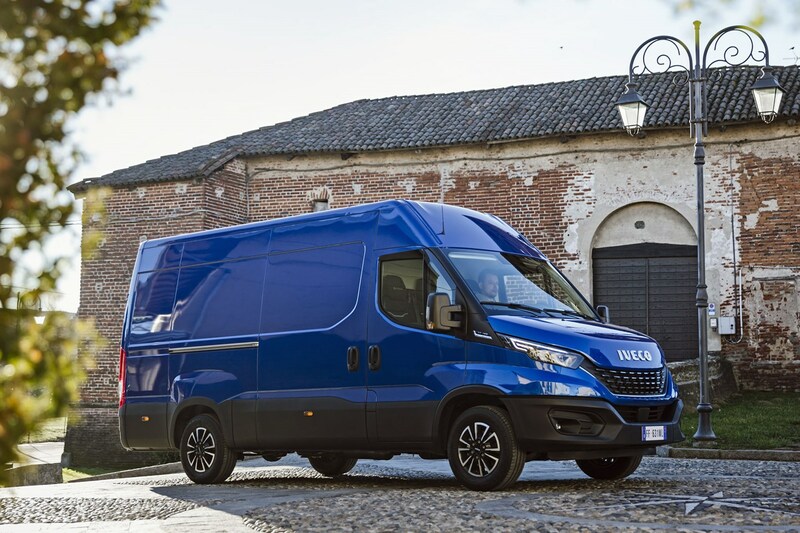 The optional connectivity box available on 2019 Dailys allows Iveco's service technicians to remotely log into the van to perform diagnostics tests. This means that if you see a warning light come on, you will no longer need to visit the dealer to find out what the problem is - at least in some cases. If it's a software issue, Iveco reckons it will even be able to repair the problem remotely as well, assuming an update for the offending code is available. Clever stuff, if it works, as it should save you the cost of unanticipated downtime. See also the predictive mainenance capabilty detailed in the Costs section above. While safety equipment for previous versions of this Iveco Daily was limited to the mandatory driver’s airbag, ABS and electronic stability control (ESC) system – plus optional lane departure warning – the 2019 facelift has brought in a whole raft of extra features, making the Daily one of the most competitive vans for safety in its class. However, you will have to pay more to maximise the Daily’s abilities, as Iveco continues to offer only the bare minimum as standard. 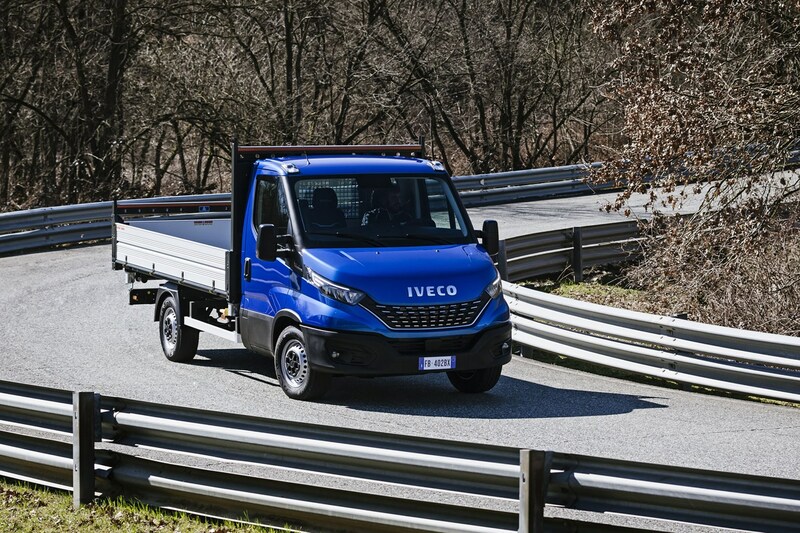 The most important new safety feature for the 2019 Iveco Daily is the availability of the Advanced Emergency Braking System and City Brake Pro. This is an autonomous emergency braking system that works from 3mph upwards (that’s a very low speed for one of these systems, intended to prevent parking accidents). Its ability to avoid accidents depends on the speed you’re travelling at (and indeed the speed of the vehicle in front that you’re about to hit), but it’s very much a modern system, rather than one of the older type that only functions up to 30mph. Shame it doesn’t have pedestrian detection – for that you’ll need a 2019 Ford Transit – and that Iveco doesn’t include it as standard (unlike Volkswagen, Mercedes and Ford). This uses the brakes to automatically counteract side winds. Seems to work well. Iveco’s ProActive Lane Keeping Assist uses the electric power steering to gently stop you from wandering out of your lane on the motorway. This effectively means the Daily will steer itself for short periods. Works smoothly and calmly in real life, unlike some rival systems which can prove rather aggressive. This is an enhancement of the also new adaptive cruise control system, and allows the Daily to automatically follow the vehicle in front during a traffic jam – meaning the van will take control of accelerating and braking when stuck in a queue. It only works with the Hi-Matic automatic gearbox, and is operated by a deliberate button press in the cab – so you won’t find the Daily suddenly taking control unexpectedly. Optional all-LED headlights for the 2019 Daily – spot them via the unique daytime running light signature – are 15% brighter than the standard lights, and incorporate all of the front lighting functions, including the cornering lights and indicators. This moves the lighting elements out of the lower bumper (reducing replacement costs should the bumper get damaged) and includes LED bulbs that are claimed to last the life of the van – lowering costs and avoiding annoying MOT failures. The 2019 Daily is available with hill descent control to automatically maintain a steady speed when travelling down tricky slopes; this is designed for site work where surfaces may be treacherous, and is more commonly found in off-road vehicles than on vans. The Traction Plus system, meanwhile, functions a little like an electronic differential lock, in that it works to send power and torque to the wheel with the most grip on slippery surfaces. It’s very unusual to find these features on a rear-wheel drive vehicle. 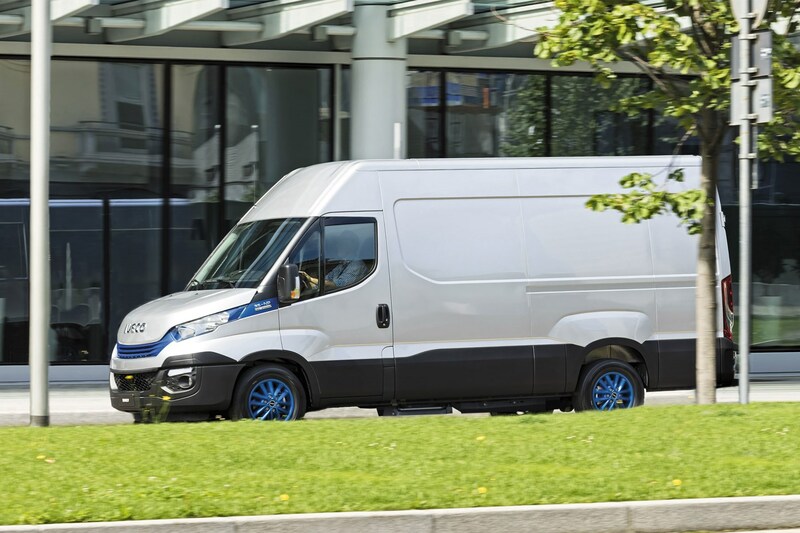 The 2019 Iveco Daily also becomes the first van to offer tyre pressure monitors on twin-wheel rear axles. 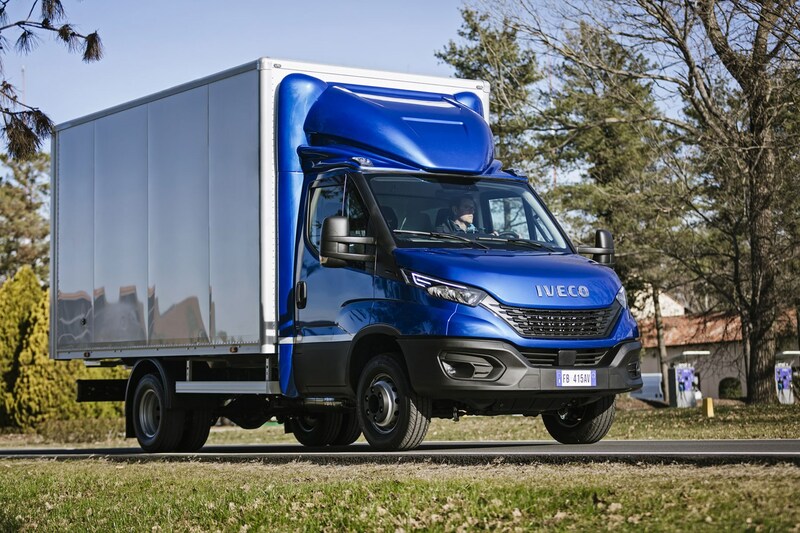 Adding all of this stuff as individual options is going to be expensive, but Iveco is keen to push the new tech so has come up with a number of packages that collect popular options into more affordable groupings. You may still feel these add-ons are expensive, but compare the initial cost to the reduction in repair expense due to improved van and driver safety, and you may start to see how the extra kit balances out over the vehicle’s lifetime. Much of the this new active safety tech has been added to meet fleet demands, based on exactly that cost equation highlighted above – reducing damage to the vans reduces downtime, which ultimately saves money (or at least, stops it being spent). To make sure drivers can’t then circumvent these measures by switching the active safety aids off or reducing them to their minimum setttings, the same optional connectivity box that used for fleet telematics can also be used by fleet managers to lock the Daily into its maximum safety settings. 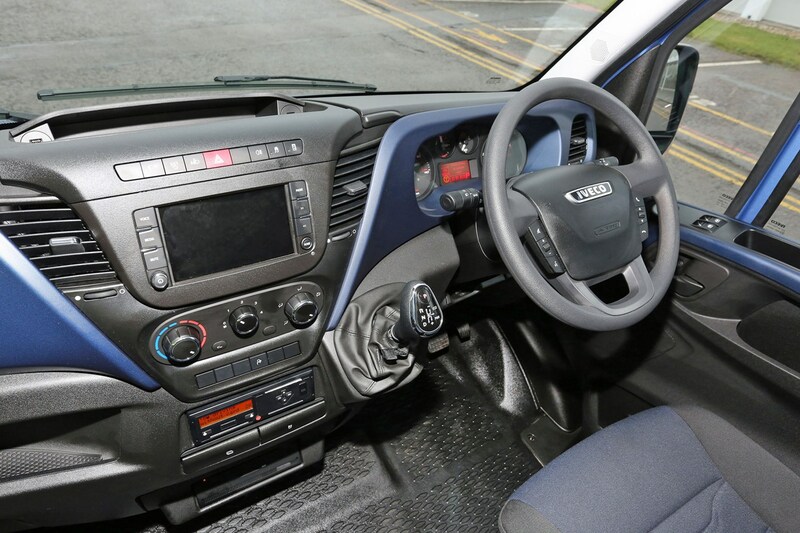 Similarly, the new (2019-on) electric handbrake can be linked to various safety features in the van – for example meaning that it won’t release unless the driver is wearing a seat belt. Other features on the Daily's comprehensive options list include an electromagnetic retarder, which provides a braking force of up to 470Nm and reduced brake wear, wider wheel profiles, rear reversing camera and rear air suspension, for ease of loading and unloading. Which IVECO Daily is best for me? The Iveco Daily offers an extensive number of body sizes - which you can learn more about on our dedicated Dimensions page - while its truck-style chassis means it's very suitable for a wide-range of conversions. As such, you're very likely to be able to find a Daily variant to suit you. Especially given the number of engine options, covering traditional diesel as well as CNG and electric power (though the Daily Electric is rather slow). However, remember that payload at 3.5-tonne gross vehicle weight isn't especially high. Whatever Daily you choose, we recommend the Hi-Matic eight-speed automatic transmission option, where available.